Adam Wheeler plagiarised other people’s work, forged transcripts and gave fake recommendations to blag his way into one of the world’s most prestigious universities. 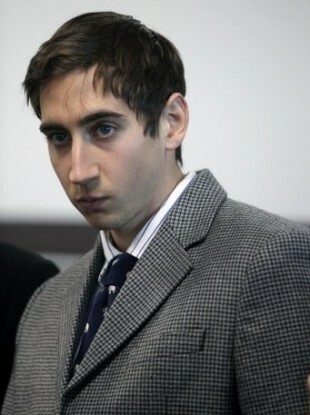 Adam Wheeler, is seen before his court proceedings at the Middlesex County Superior Court in Woburn, Mass. AN AMERICAN STUDENT who lied his way into a Harvard University by forging transcripts and letters of recommendation, and plagiarising other people’s work has been given a ten-year probationary sentence and ordered to repay $45,806 (€34,740) to Harvard for the prize money, grants, and financial aid he received. Adam Wheeler was found out when a professor who was reviewing his application for a Rhodes and Fulbright Scholarship realised he had plagiarised another student’s work: Wheeler had made it appear that he was a straight-A student in order to be granted the scholarship. Following further investigation, it was discovered that Wheeler had forged letters of recommendation from Massachusetts Institute of Technology and the prep school Phillips Exeter Academy. He was expelled from Harvard in October 2009, in his final year – but despite this, Wheeler continued to lie. He applied to be admitted as a transfer student to Yale and Brown Universities – and was accepted before he was discovered. In applying to the other institutions, he even provided a fabricated recommendation from the very Harvard professor who had uncovered is his web of deceit. Judge Kottmyer ordered Wheeler to stay away from Harvard and the other institutions he defrauded; the professors whose signatures he forged; and barred him from representing himself as a Harvard student or graduate. She also ordered him to continue receiving therapy, and forbade him from profiting from his story. Email “Student who lied his way into Harvard ordered to repay $45k”. Feedback on “Student who lied his way into Harvard ordered to repay $45k”.